Are you afraid of tipping over the camper while you are in bed and the camper is on the jacks? Reduce the chance that your camper will tip over due to an incorrect or unstable positioning or high winds or overloading the overhang with Rieco Titan's new Stable Stix. Truck campers sway as they sit on their jacks. It doesn't matter how big or heavy the camper is. Every single move you make causes a rolling effect. No-one wants to bring extra bottle jacks and blocks of wood for added stability. Where are you going to put all that stuff? Other products force you to remove your camper from the truck in order to use their product. Not with Stable Stix. 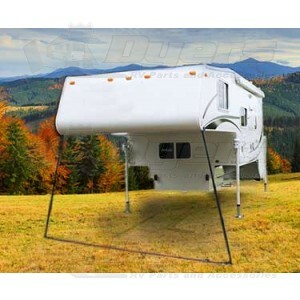 Rieco-Titan knows you don't always want to spend all that time backing in and out from underneath the camper. In minutes, even with the camper on the truck, you'll have a shake free night. Truck campers and Stix adjust from 68" to 86"
Easy set up. Two minutes and you are done! Adjust from 68" to 86"
We take our camper off the truck frequently, and was always uneasy about it (yea yea I know slim chance it would tip). During some heavy winds that came upon us unexpectedly I figured it was time to try these out. Easy setup, easy take down, the only issue is that the foam padding wears off easy but that is easy to replace so not going to downgrade it for that. We encountered more high winds but these kept it upright with no problem. We used these on a recent trip in our pickup camper. They worked very well and were easy and quick to set up and take down. I was very pleased with their performance. My only complaint was that the padding on the top part of the product was very thin and broke down after only a few uses. I had to replace it with paper towels wrapped with duct tape. Better padding needs to be installed. If you are looking to stop every bit of movement this will not do it. It does remove a great deal of it though. Since my concern has been the movement and stress placed on my front jacks (extendable for a dually) any improvement is a good thing. I'd say this product removes about 75% of it. Since it is fairly inexpensive, no drill, sets up in a couple of minutes and does a decent job, I'm happy I bought them. Dyers did a great job getting them to me in a couple of days. Good folks to deal with.